Where I feel the need to write not-good, somewhat-sonnet-like poetry. And, okay I admit, Gail and Lisa kind of covered the things I wanted to say in their excellent posts, leaving me frowning and scratching my head. Let me just say that SLEEPING WITH WARD CLEAVER is a must read for anyone who is married, has been married or thinks they may, someday, get married. It is at once a cautionary tale and an inspiration and a wonderful story about what happens after happily ever after. And without further ado, here are my poetic offerings. Jack to Ward…and Back Again? But take a deep breath and blow-dry your hair. But pull up your brastraps, think to your rights. But feisty and stubborn, Claire does not run. Will Claire spend her life resentful and bored? And legend with tongue and hand…and a pen. Oh be not taken, Claire Dolittle, no! Of crack-of-dawn jogging, Sunday night mouth. The past with rosy colors for his sake. Gets away all the time, air in a glass. I didn’t say they were good…. My heartfelt congratulations to Deb Jenny Gardiner and biggest, best wishes for SLEEPING WITH WARD CLEAVER! P.S. Don’t forget to check out the contest page for your chance to win a signed copy of SLEEPING WITH WARD CLEAVER and other wild prizes. 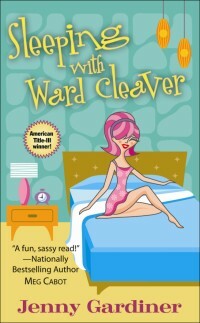 ← Are You Sleeping With Ward Cleaver? Huh. No, really Danielle, those are hilarious – I had no idea you were such a talented poet! Jenny, congrats on launch week day 4. What rhymes with Canada? I’m STILL laughing, Danielle!! These are wonderful… just wonderful. What a great tribute to Jenny! Jenny: Don’t tempt me with the limerick! I’m so pleased you like these. Your book provided lots of inspiration! Gail: I had lots of chuckles (and groans) while writing them last night. Happy to put a smile on your face. I’m off to buy Jenny’s book today! Oh these are so fun. You realize now all of us are going to want a poem to go with our releases. Oh, and a huge congrats on your release, Jenny! Thanks you guys. I was trying to think of what rhymed with Canada and I just kept thinking “orange”…(that is supposedly the only word in the english language that hasn’t got a rhyming word for it). Fans can also enter to win a signed copy over at my blog: Manic Mommy! What fun it is to pimp books! Danielle, you are awesome!!! What charming and clever tributes. How on earth am I going to follow-this up for tomorrow? Hmmm…methinks the bar has been raised, yet again. Just dropping in to wish Jenny a ball. Here’s to Ward and the wit that carries it through. Danielle — do your gifts know no bounds? Maureen: Thanks! You’re going to love Jenny’s book. Larramie: Since no one has given me the gong on this idea and I admit to finding it shockingly fun, yes, I’ll do one (or two?) for everyone. Eileen: I’ll get working on yours tout suite. I’ve got some lovely rhymes for Kintock. Manic Mommy: you’re pretty hilarious yourself! Thanks for coming. Jess: he he. We never considered this factor when choosing Thursday and Friday, did we? Carolyn: Thanks for helping us celebrate with Jenny! Jenny: Of course I will do a copy for you! Now I’m blushing. Lisa: Back at ya. Back at ALL of you! I’ve just been smiling all week. Being part of this makes it like I have 6 debuts this year, not just one. I love it.